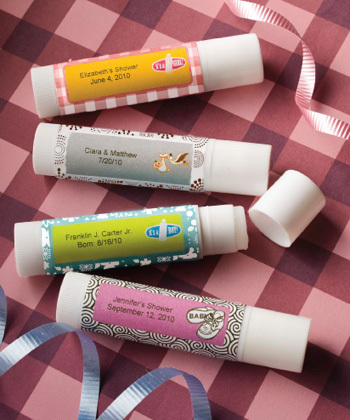 Give your Baby Shower guests some personal attention with these highly sought after lip balm favors. Sometimes little favors pack a big punch and this luscious lip balm surely fits into that category. From the , each vanilla-flavored lip balm tube measures 2.75 x .625 and features a twist bottom to raise the balm as you use it. And, to give it private label appeal, the outside of each tube is perfectly fit for the application of the personalized label of your choice. Available in an exceptional selection of colors, themes and customized titles for weddings, showers or any special occasion, the labels are included in self sticking sheets for you to easily apply. These lip balm favors come bulk packed. Please allow 3-4 days for production. Custom personalized Lip Balm tube labels are so easy to add. The Custom Designer will fill in the drop-down menus for you. All you have to do is click the blue button and design your label live in our advanced label designer!